During the past few years there have been great strides in the advancement of technology with the rise of mobile devices leading to an era characterized by the instant access to and mobility of information. Mobile technologies have more recently been used in a variety of educational settings for a variety of purposes and educational goals. Nevertheless, while the claims about the positive impact of the use of mobile technologies in different aspects of education are compelling, data on how these technologies support, for example, the understanding of complex concepts or the development of learning skills that enable students to think critically and problem-solve, are limited. 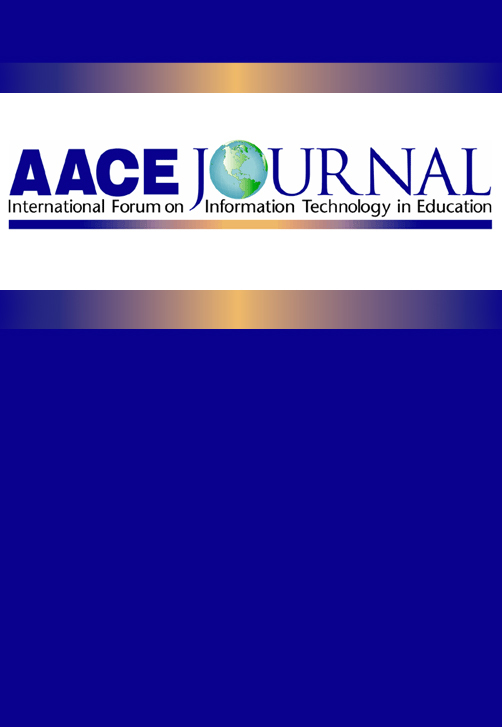 This theoretical article contends that missing, remains a detailed characterization of the accounts and the processes through which mobile technologies mediate learning, and proposes that future research in science education is directed towards: (a) exemplifying the theoretical aspects and the characteristics of design frameworks associated with mobile learning; (b) characterizing rich and complex pedagogical practices that use mobile devices; and (c) sketching the details of the processes by which students come to know through engagement in activities that use mobile technologies. Avraamidou, L. (2008). Prospects for the Use of Mobile Technologies in Science Education. AACE Journal, 16 (3), 347-365. Chesapeake, VA: Association for the Advancement of Computing in Education (AACE). Retrieved April 20, 2019 from https://www.learntechlib.org/primary/p/24434/. Abd-El-Khalick, F., Bell, R.L., & Lederman, N. G. (1998). The nature of science and instructional practice: Making the unnatural natural. Science Education, 82, 417-436. Bannasch, S., & Tinker, R. (2002, Winter). Probeware takes a seat in the classroom: Educational impact of probes improves with time and innovation. Benenson, G. (2001). The unrealized potential of everyday technology as a context for learning. Journal of Research in Science Teaching, 38(7), 730-745. Brown, J.S., Collins, A., & Duguid, P. (2001). Situated cognition and the culture of learning. In D.P. Ely & T. Plomp (Eds), Classic writings on instructional technology (pp. 31-52). Englewood, CO: Libraries Unlimited. Cajas, F. (2001) The science/technology interaction: Implications for science literacy. Journal of Research in Science Teaching, 38(7), 715-729. David, J.L. (1994). Realizing the promise of technology: A policy perspective. In B. Means (Ed. ), Technology and education reform: The reality behind the promise (pp. 191-222). San Francisco: Jossey-Bass. Demana, F., Meagher, M., Abrahamson, L., Owens, D., & Herman, M. (2003). DeBoer, G. (1991). A history of ideas in science education. New York: Teacher College Press. Dede, C., & Honan, J. P (2005). Scaling up success: A synthesis of themes and insights. In C.Dede, P.J. Honan, & C.P. Laurence (Eds), Scaling up success (pp. 227-239). San Francisco: Jossey-Bass. Dede, C., & Nelson, R. (2005). Technology as proteus: Digital infrastructures that empower scaling up. In C. Dede, P.J Honan, & C.P Laurence (Eds), Scaling up success (pp. 110-132). San Francisco: Jossey-Bass. Fishman, B., Soloway, E., Krajcik, J., Marx, R. & Blumenfeld, P. (2001, April). Creating scalable and systemic technology innovations for urban education. Paper presented at the Annual Meeting of the American Educational Research Association (AERA), Seattle, Washington. Grant, W.C. (1993). Wireless coyote: A computer-supported field trip. Communications of the ACM, 36(5), 57-59. Herman, J.L. (1994). Evaluating the effects of technology in school reform. In B. Means (Ed. ), Technology and education reform: The reality behind the promise (pp. 133-168). San Francisco: Jossey-Bass. Hsi, S. (2000, April). Using handheld technologies to connect web-based learning to outdoor investigations. Paper presented the National Association for Research in Science Teaching Annual Meeting (NARST). New Orleans, LA. Hurd, P.D. (1989). Science education and the nation’s economy. In A.B. Champagne (Ed. ), This year in school science 1989: Scientific literacy (pp. 1540). Washington, DC: American Association for the Advancement of Science. Kuhn, T. (1962). The structure of scientific revolutions. Chicago: University Press. Kukulska-Hulme, A. (2005). Introduction. In A. Kukulska-Hulme & J. Traxler (Eds), Mobile learning: A handbook for educators and trainers (pp. 1-8). London: Routledge. Lewis, T. (2006). Design and inquiry: Bases for an accommodation between science and technology education in the curriculum? Journal of Research in Science Teaching, 43(3), 255-281. McKenzie, J. (2001). The unwired classroom: Wireless computers come of age. National Research Council. (1996). National science educations tandards. Washington, DC: National Academy Press. Parr, C., Jones, T., & Songer, N. (2004). Evaluation of a handheld data collection interface for science learning. Journal of Science Education and Technology, 13(2), 233-242. Roschelle, J. (2003) Unlocking the learning value of wireless mobile devices. Journal of Computer Assisted Learning, 19, 260-272. Rogoff, B. (2003). The cultural nature of human development. New York: Oxford University Press. Seppala, P., & Alamaki, H. (2003). Mobile learning in teacher training. Journal of Computer Assisted Learning, 19(3), 330-335. Sharples, M., Taylor, J., & Vavoula, G.N. (2005). A theory of learning for the mobile age. In R. Andrews & C. Haythornthwaite (Eds. ), The SAGE handbook of e-learning research (pp. 221-247). London: Sage. Soloway, E., Norris, C., Blumenfeld, P., Fishman, B.J., & Marx, R. (2001). Devices are ready-at-hand. Communications of the ACM, 44(6), 15-20. Trinder, J. (2005). Mobile technologies and systems. In A. Kukulska-Hulme & J. Traxler (Eds), Mobile learning: A handbook for educators and trainers (pp. 2-24). London: Routledge. Zurita, G., & Nussbaum, M. (2004). A constructivist mobile learning environment supported by a wireless handheld network. Journal of Computer Assisted Learning, 20, 235-243.